Wild woodpigeon is making a name for itself and quite rightly so. Tasty and economical, this naturally dark game meat offers a light gamey flavour. It’s less intense than a venison haunch steak and more subtle than pheasant in taste. Available all year round, although better enjoyed in the spring and summer when they have an abundance of food available. They feed on seeds, grain, buds and cereal crops such as barley, and they have to drink a lot as there’s not enough moisture in their food. Woodpigeon is a great source of protein, which can help your body repair cells and make new ones. It also contains minerals such as iron, crucial for producing energy and keeping your immune system healthy. For woodpigeon breasts melt butter and oil in a frying pan, heat the pan until hot and then add the fillets. Cook for 30 seconds on each side over a high heat, then reduce heat and cook for another 2 minutes on each side. 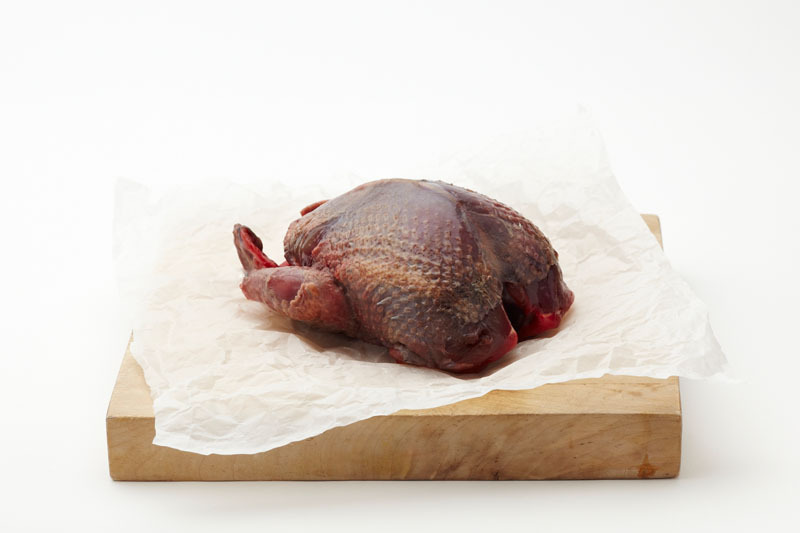 One woodpigeon breast is enough per person for a starter however we recommend two breasts per person for a main course. A whole woodpigeon can be cooked in a pre-heated oven (180C/350F/Gas 4) for 30 minutes. We recommend adding a bay leaf to the cavity when roasting. Remember the carcass can be used to make stock. To make your stock simply add the carcass to a big pot with carrots, a few black peppercorns, fresh thyme and parsley. Bring to a simmer and cook for 2-3 hours (to taste) and then strain the stock. For best results leave the stock to go cold and chill overnight. Unlike chicken, woodpigeon can be served whilst pink in the middle. Overcooking game can dry the meat out and weaken the flavour. We endeavour to remove all shot from each bird but occasionally it will still contain shot. Woodpigeon goes well with juniper berries, cherries, apples, shallots, ginger, honey, bacon or thyme. This entry was posted in Field and Flower and tagged Wild Game, woodpigeon. Bookmark the permalink. ← Field&flower in Good Housekeeping magazine!